When the time comes to embark on the journey of implementing a new EHR system, there are a number of factors to consider in the overall budget and timetable. 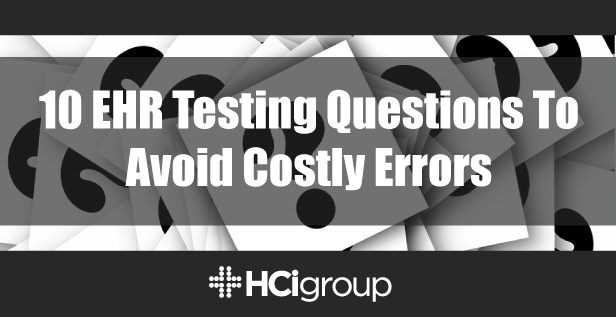 While going through your EHR Integration checklist, testing is often one area that is shortened to make up for lost time or cost savings, but what may be an initial time saving act, can end up being quite a costly mistake down the road. In this post we take a look at 10 key questions to ensure your testing sets you up for a successful go-live. Why is EHR testing so important? Often testing is perceived as a necessary evil and identifying issues to be negative and irritating, but in fact it is just the opposite. The more issues identified during the testing process, the more successful the Go-Live event. Spending more time on testing will validate the build team’s configuration and designed workflows. A proven testing strategy develops proper communication with all areas of the health system. Accurate feedback on designed workflows and configuration can provide beneficial time savings and a successful implementation. Proper testing provides the feedback to not only the electronic pieces of your clinical workflows, but also the people elements. There are nightmare stories about facilities’ unproven testing strategies that led to a significant number of redevelopment hours and lost revenue. 1) How much time is allocated to each phase of your testing strategy? 2) Who is assigned to implement your testing strategy and at what level does that person report to Leadership? 3) Has your testing strategy been proven as an effective strategy for similar projects? 4) Do you have an organized library of testing scripts by workflow and type? 5) Are all of the clinical workflows documented for your facility? 6) Does your testing strategy include “Negative Testing”? 7) Have you implemented any automation tools vs electronic tools to assist with testing? 8) What experience does your testing coordinator have in large multi-facility implementations? 9) How are issues / bugs documented and tracked? 10) How accurate are the status reports directed to Project Leadership? By asking yourself these questions and implementing a proven testing strategy, you will be set up to have a well-managed, well organized, and successful test of the system going into the Go-Live. Remember, testing should realistically reflect the health system performance after the implementation is completed. Before any EHR system goes live, all the pieces must mesh together with clockwork like precision and pass these crucial testing phases. After all, patient safety is at stake, and so is the proficiency of your entire healthcare organization. If you have additional questions or would like to speak with the HCI Team to assist in your product testing, click here for immediate assistance.